FRIDAY, 05 AUGUST – Universiti Malaysia Sabah (UMS) is committed to becoming a university of excellence in teaching and research. UMS, through its Registrar Department in collaboration with the Faculty of Engineering and Atikah Enterprise joint hands in the construction of Eco Sulap project UMS Peak and ‘Pilot Project Solar Farm’. The launching ceremony was officiated by the Vice-Chancellor of UMS, Professor Datuk Dr. Mohd Harun Abdullah at the Institute of Tropical Biology and Conservation (ITBC), today. In his speech, he said that the Eco Sulap UMS Peak Construction Project was one of the projects that supported tourism activities in UMS, under the Appreciation of Nature Package. “This package will highlight the unique features of the natural environment in UMS campus such as the hills at UMS Peak. 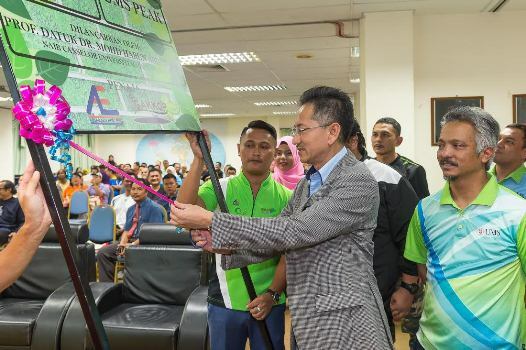 Besides, activities such as trekking along the trails of UMS Hill that is approximately 2.8 kilometres is the highlight of the Eco Sulap UMS Peak, he said. Datuk Harun said the project would also be expected to provide experience to students and the public through its Nature Education Camp. He said, the package would involve camping at UMS Hill to provide learning experience and ways to preserve the environment through lectures, workshops, field work, trekking, night walk, appreciation of and observation of nature, mind games, Group Trainings (LDK) and discussion including presentation by students. Meanwhile, he disclosed that the ‘Pilot Project Solar Farm’ was carried out by Electrical Degree students of the Faculty of Engineering in the use of alternative energy to study the effectiveness and use of solar for electricity generation purposes.